Autumn is in the air, and Mother Nature is putting on a truly glorious show. Squirrels scamper in the colorful leaves, and birds busy themselves with their winter travel plans. 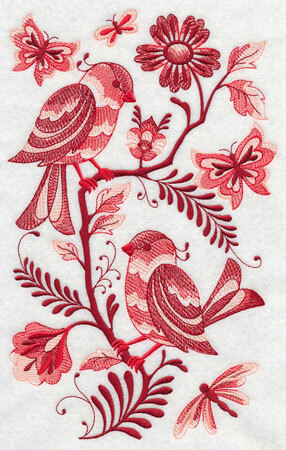 Bring the beauty and magnificence of this season to your embroidery projects! 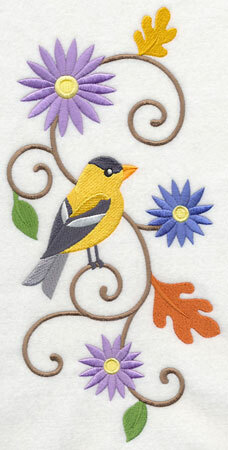 These new machine embroidery designs are a wonderful way to add charm and color to garments and home decor. 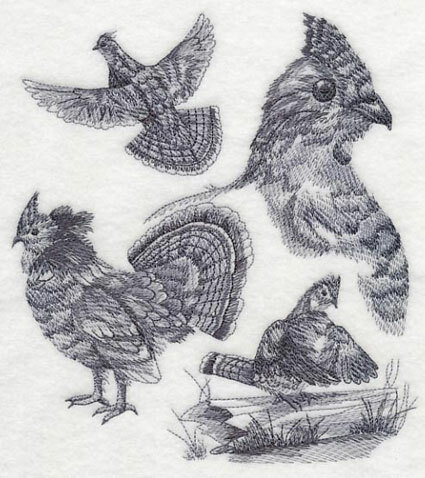 Begin with crafty birds with colorful patches on their wings; end with sleek sketch medleys of quail and ruffed grouse. 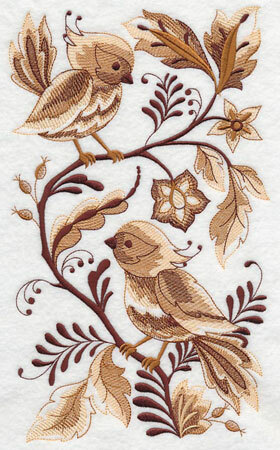 And in the middle....beautiful birds in styles that range all the way from realistic to whimsical. Scroll down the page to see the new designs! 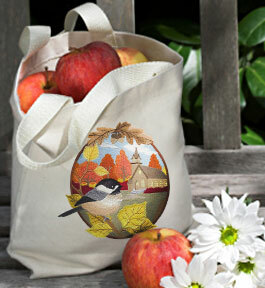 Bring the beauty of autumn to tote bags, wall hangings, table linens, and towels! 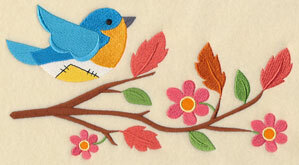 Crafty birds are bright and colorful accents to your embroidery projects. A chickadee and owl have colorful patches on their wings and bodies. They pose so prettily on leafy branches. 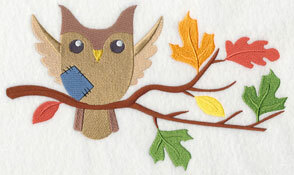 We stitched the leaves in blazing autumn tones. 9.41" x 5.53" and 7.81" x 4.58"
9.40" x 5.60" and 7.80" x 4.64"
6.86" x 4.09" and 3.85" x 2.29"
A goldfinch and robin are delightful with colorful patches! Autumn leaves and flowers add beauty and charm to the branches. 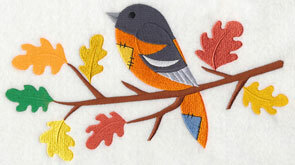 Add these designs to fall-flavored placemats and table runners, as well as aprons, tea towels, and tote bags. 9.40" x 5.54" and 7.80" x 4.59"
9.40" x 6.05" and 7.81" x 5.02"
6.83" x 4.40" and 3.85" x 2.48"
Arrange all six birds on a wall hanging or lap quilt. 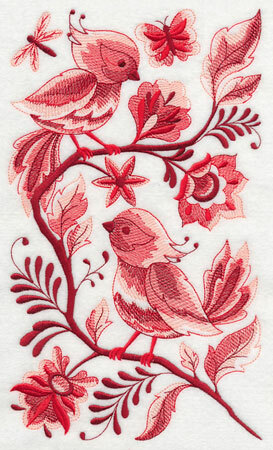 Or, embroider them on bath towel sets and kitchen linens! They will add color and contemporary charm everywhere they land. 9.40" x 5.05" and 7.80" x 4.19"
9.40" x 5.25" and 7.80" x 4.36"
6.85" x 3.83" and 3.85" x 2.15"
Let these crafty and colorful birds land on your embroidery projects today! Order them individually by clicking the links above, or get all six in a design pack. 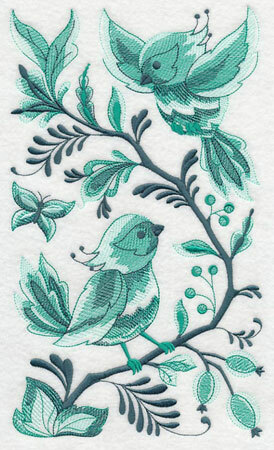 A few years ago we drew and digitized designs that featured birds in winter and Christmas scenes. 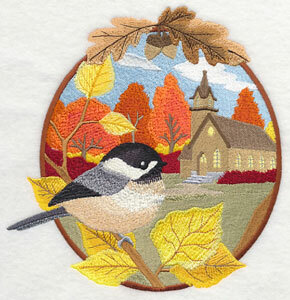 Many embroiderers wrote in and asked for these types of designs to be created for other seasons as well. Autumn seemed an excellent time to develop those requests! 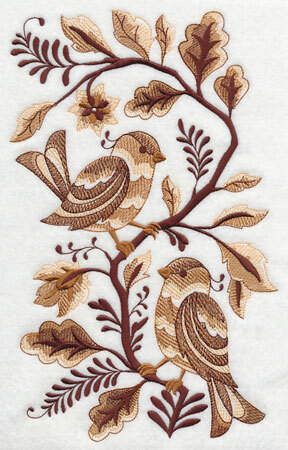 In these new designs, birds pose in autumn leaves, overlooking richly-detailed pastoral scenes. 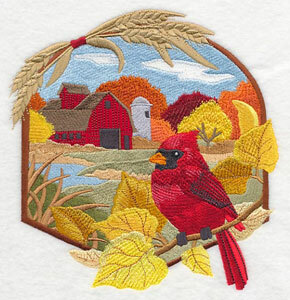 Below a cardinal perches near a farm, while a chickadee spies on a country church. 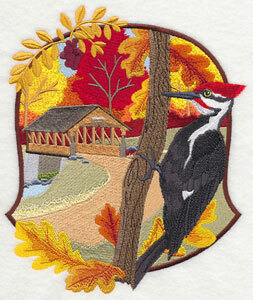 6.91" x 7.20" and 5.87" x 6.10" and 4.86" x 5.06"
A pileated woodpecker poses dramatically near a covered bridge. And, a blue jay perches beautifully on a leaf-covered branch near an abandoned mill. These designs are vibrant in color, and richly detailed with highlighting and shading to achieve a realistic look. If you're new to working with these types of designs, and would like some tips and tricks for fabric and stabilizer choices, please read the tutorial about embroidering complex designs. It has excellent information for you to get picture-perfect results! 7.21" x 6.91" and 6.11" x 5.86" and 5.03" x 4.81"
The city of Delft in the Netherlands is known for producing beautiful pottery known as Delftware. Over time, this "Delft Blue" style has been translated to fabrics (similar to toile), wall paper, gift wrap, and embroidery designs. 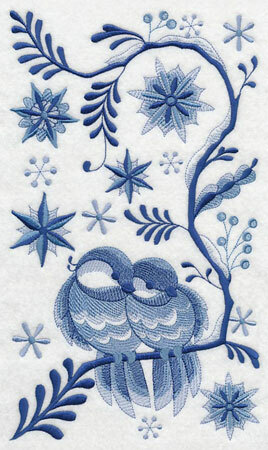 Today we're pleased to present new four seasons designs in the popular, fashionable Delft style. 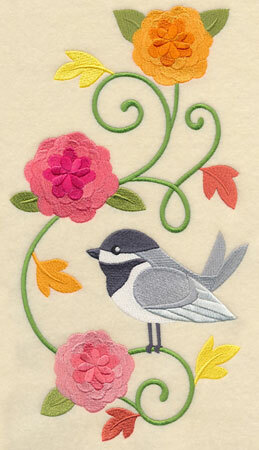 Four birds (chickadees, cardinals, goldfinches, and jays) are represented in each of the four seasons. And, we love to experiment in color! Rather than the traditional bluescale that you normally see with Delft, we used different colors for the different seasons. 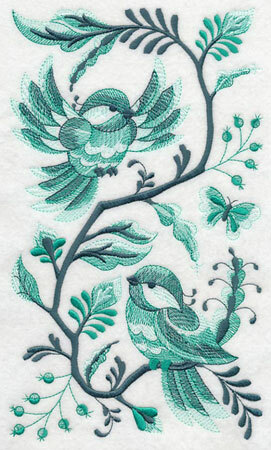 In the designs below, spring chickadees are stitched in jade and turquoise, while summer chickadees are in hot, fiery red. 6.51" x 11.00" and 5.56" x 9.40"
6.60" x 11.00" and 5.64" x 9.40"
4.68" x 7.80" and 4.11" x 6.85"
Autumn chickadees are stitched in rich shades of brown, and the winter birds are in frosty hues of blue. Use all four in a four seasons wall hanging! Experiment with colors to achieve the effect that you want for your home decor. 6.48" x 11.01" and 5.54" x 9.41"
6.45" x 11.01" and 5.51" x 9.41"
4.57" x 7.80" and 4.02" x 6.86"
Spring and summer cardinals are in jade and red. 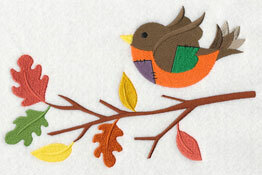 Use all four cardinal designs together in a wall hanging, or mix-and-match the birds for variety. 6.45" x 11.00" and 5.51" x 9.40"
6.49" x 11.01" and 5.55" x 9.41"
4.59" x 7.78" and 4.04" x 6.86"
Autumn cardinals perch on a branch with fall leaves and flowers. 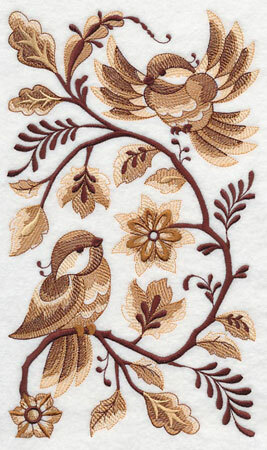 We stitched the design in shades of brown to reflect autumn's palette. 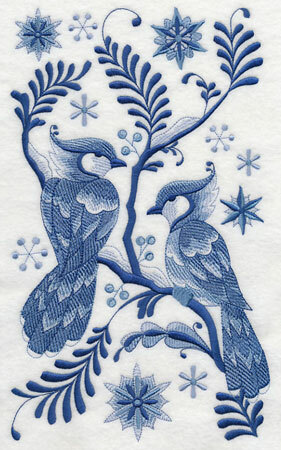 For the winter design, a jay flies to his mate amid frosty snowflakes. 6.65" x 11.01" and 5.68" x 9.41"
6.78" x 11.01" and 5.80" x 9.41"
4.82" x 7.83" and 4.22" x 6.86"
These jays have beautiful detailing on the feathers. 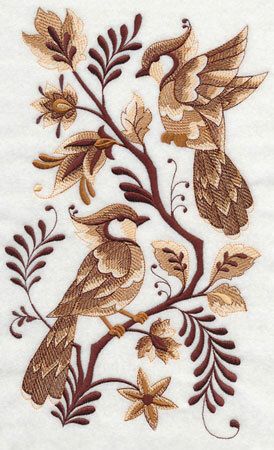 The different shades of thread used in the designs bring the definition and patterns to the viewer's eye. 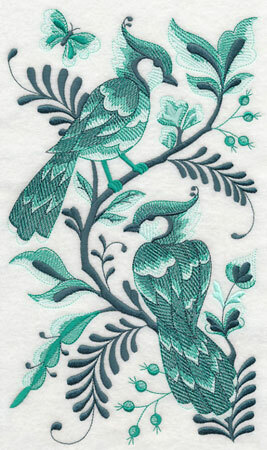 We embroidered the spring scene in shades of jade, representing new life and growth. Shades of red were used in the summer scene, represent the fiery hotness of the sun. Be sure to experiment with colors until you find the palette that suits your taste! 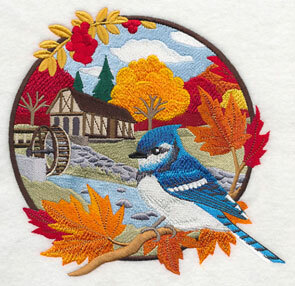 6.42" x 11.00" and 5.48" x 9.40"
6.48" x 11.00" and 5.54" x 9.40"
4.59" x 7.79" and 4.03" x 6.85"
Autumn jays are embroidered on shades of golden brown. In the winter design, there's a bit of snow on the branches, along with sparkling snowflakes. 6.80" x 11.01" and 5.81" x 9.41"
6.58" x 11.00" and 5.62" x 9.40"
4.66" x 7.80" and 4.10" x 6.85"
Finches are pretty in shades of jade. The summer scene shows them in hues of red. Experiment with color to find the palette that suits your project. 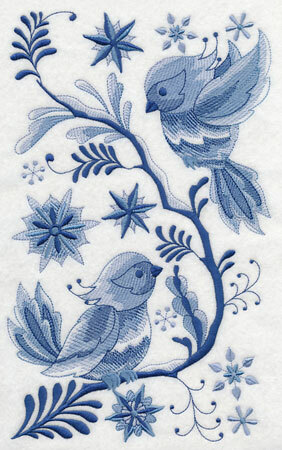 Delft designs use three shades of colors to achieve the remarkable artistic effect. They are unique in style and appearance, and a lovely addition to home decor! 6.41" x 11.00" and 5.48" x 9.40"
6.90" x 11.00" and 5.90" x 9.41"
4.91" x 7.82" and 4.30" x 6.86"
Finches in shades of brown represent autumn. 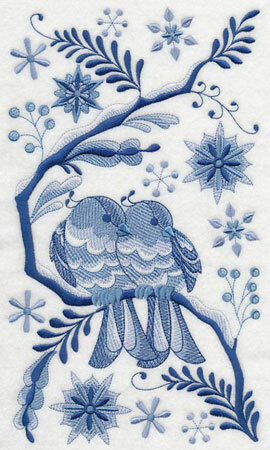 And, they snuggle together in the winter scene, colored in hues of blue. 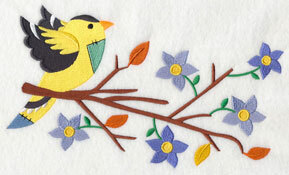 Make a wall hanging with all four finches, or use all four of the winter designs. Mix and match as you design your project! 6.81" x 11.00" and 5.82" x 9.40"
4.55" x 7.80" and 4.00" x 6.85"
The sixteeen designs shown above are available in a design pack. Get all four seasons for the cardinals, chickadees, finches, and jays in this pack. denim jeans. 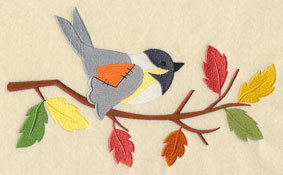 Here a finch and chickadee pose in autumn leaves and flowers, with a graceful winding vine. 5.61" x 11.64" and 4.84" x 9.40"
6.41" x 11.64" and 5.17" x 9.41"
4.30" x 7.81" and 3.76" x 6.83"
A blue jay's bright colors are paired beautifully with gold flowers. 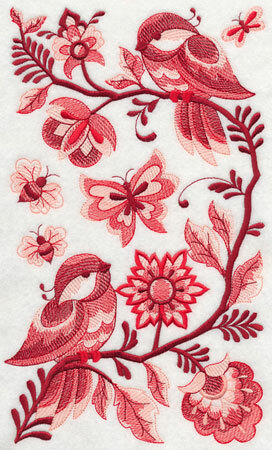 Embroider this design up the sides of a placemat, pullover, or cardigan. 5.90" x 11.75" and 4.72" x 9.40" and 3.92" x 7.79" and 3.44" x 6.85"
The vertical arrangements are shown above - and horizontal designs are available, too! These designs are nice on shirt fronts and backs (very chic on the yoke!). 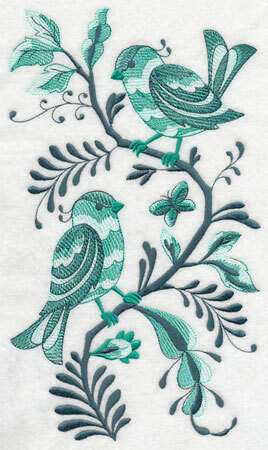 They're also lovely on the bottoms of tea towels and the ends of table runners. 11.64" x 5.64" and 9.41" x 4.56" and 7.81" x 3.78" and 6.87" x 3.33"
Dress up terrycloth and waffle-weave kitchen towels with these fresh fall designs. They're also colorful and vibrant additions to tote bags and rectangular pillow covers. 11.64" x 5.49" and 9.41" x 4.43" and 7.81" x 3.68" and 6.86" x 3.23"
This jay is bright and vibrant in fall flowers and leaves. Swirling, elegant filigree lines adds a contemporary effect. A fashionable addition to shirt fronts and yokes! 11.75" x 4.14" and 9.41" x 3.32" and 7.80" x 2.75" and 6.88" x 2.43"
Sketch-style designs use three colors - primary, light, and lighter still - to create the unique effect. They're light and airy, and excellent choices for shirt fronts, tote bags, and towels. 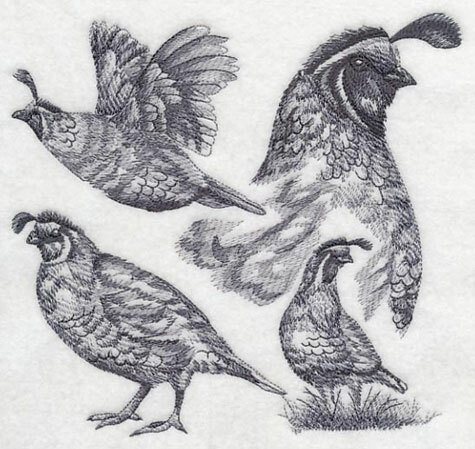 This design features a quail in four poses. 7.33" x 6.91" and 6.20" x 5.84" and 5.16" x 4.86"
The ruffed grouse loves forests, and is found in many parts of North American, especially the east and midwest parts of the United States, and Canada. Their favorite homes are in woodsy forests. 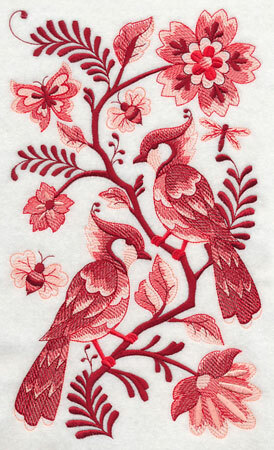 This design features four poses of the grouse - including the "drumming on air" in the lower right. 6.88" x 7.41" and 5.85" x 6.30" and 4.85" x 5.22"
This week's request comes all the way from Switzerland! 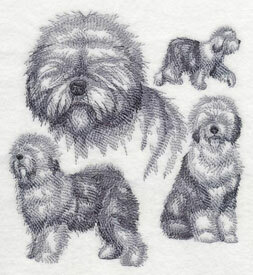 Fabienne enjoys the sketch styles and the "classy canine" line. 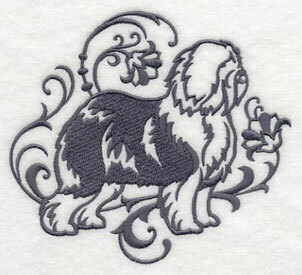 Her favorite breed is the Old English Sheepdog, and requested the breed in both of those styles. Thank you, Fabienne! We are happy to oblige! 6.90" x 7.45" and 5.87" x 6.34"
5.40" x 4.81" and 3.87" x 3.45"